Saying goodbye is never easy, but it can be especially difficult for a young child. For one little boy, it was challenging to say goodbye to his best friend, a 17-year old pup named BaoBao. BaoBao was riding on the back of the scooter when she fell into the street. She was hit by a car and the 'rear tire went over BaoBao's back, crippling her and smashing her pelvis," wrote Youtuber M13. Even though BaoBao frequently accompanied her owner on the scooter, the duo was in the wrong place, at the wrong time. "She had just had an amazingly fun week....and with her hearing, sight, bladder control.....all already diminished greatly....I thought it best to not put her through the pain of surgeries and physical therapy..," he wrote in the Youtube post. He made the difficult decision to put her down, but first had to explain the situation to his young son. 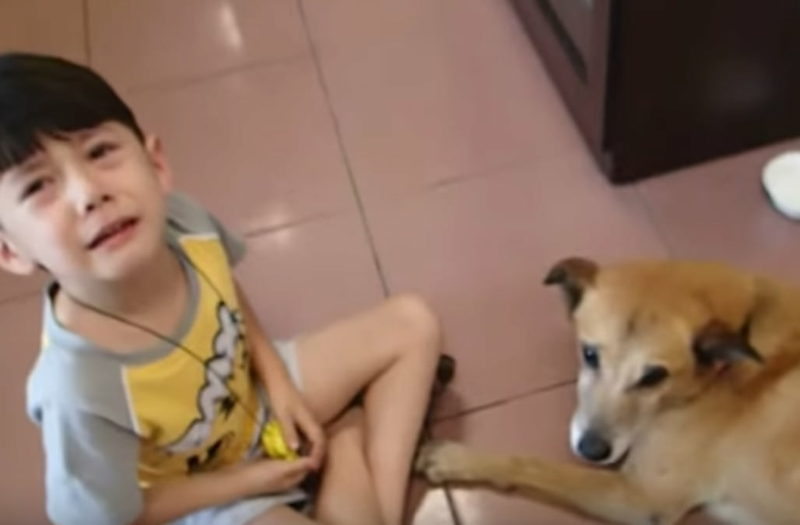 Tearfully and tenderly, the little boy comforts and says goodbye to his pal.